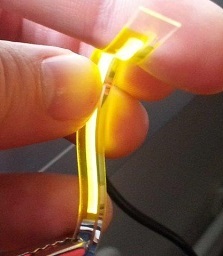 In the scientific community, the LunaLEC liquid light concept is known as the Light-Emitting Electrochemical Cell (LEC). 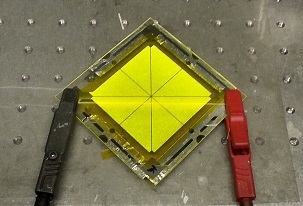 From a distance, this technology is very similar to OLED – both technologies use a flat planar lighting structure in which the light-emitting organic layer is sandwiched between two conductive electrodes. LunaLEC is still developing the manufacturing process, which means that they can provide prototypes from the old, manual process. 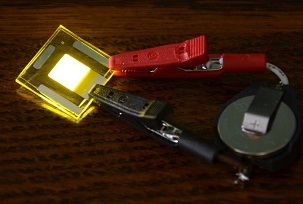 Deliveries will be limited, but will enable you to test LECs in your developing applications and devices. Devices for resale are expected to be available in limited quantities by beginning of 2016, and general availability by end of 2016. The actual pricing is not at all reflecting price of future products, as pricing is expected to drop by order(s) of magnitude.